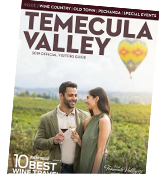 Visit Temecula Valley is a nonprofit organization that has approximately 200 members that are specifically tourism related businesses including wineries, restaurants, retail and specialty boutiques, hotels and more. You may be surprised to know that over $724 million dollars have been generated in tourism revenue in 2017, in Temecula alone. Please fill out the following information and then submit payment for membership. Our Membership Department will reach out to welcome you as soon as both steps are completed successfully.